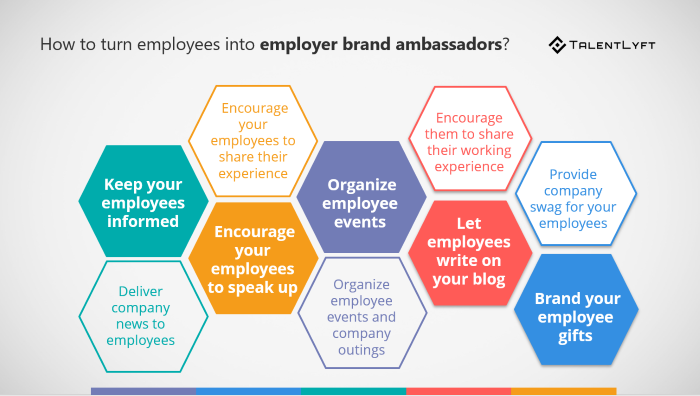 Your best employer brand ambassadors are your employees. They are the most trusted source of truth about how your company works. If you want to tell the story of your company, they are your best storytellers. Learn how to encourage them to share a compelling story about your company and help you recruit top talent! Your employer brand is already out there. Even if you haven’t consciously taken steps to affect how your company is perceived by job candidates, your website, job descriptions, and social media accounts together paint a picture of what working at your company might be like. Just like a consumer brand, an employer brand is the sum of all the touchpoints a candidate might have with your company that, consequently, inform their perception of you as an employer. 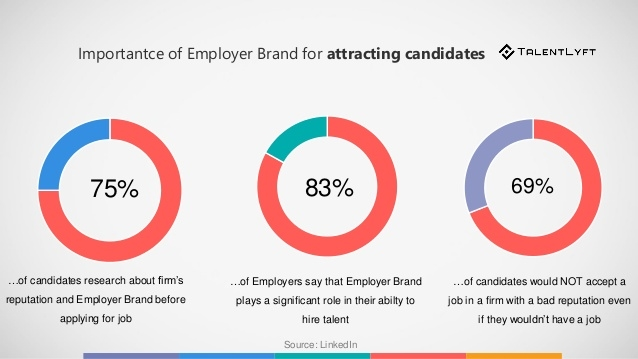 It’s no surprise then that employer branding influences the quality and volume of candidates that apply with you. 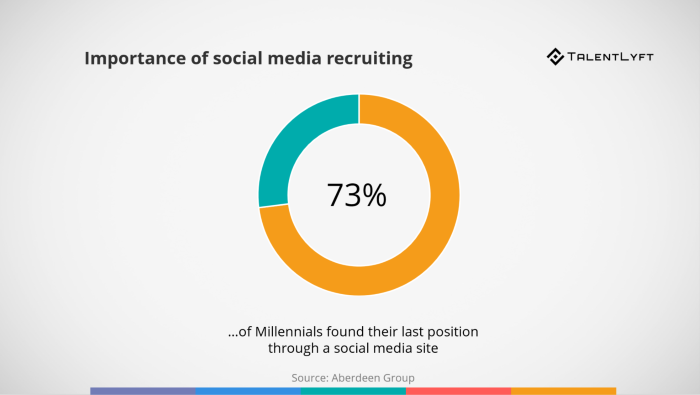 73% of 18-34-year-olds say that they found their previous job through social media, while 90% percent of job seekers say that they would apply for a job if the employer brand was actively maintained on social media. If those numbers are starting to make you sweat, it might be time to learn how to promote your employer brand on social media and enhance it using company review sites. As it has for consumer-facing brands, social media and review sites have democratized the messaging between employers and job seekers. With sites like Glassdoor, job seekers have an unprecedented level of access to previously taboo subjects: salaries, CEO approval, and work-life balance. If you don’t join the conversation, your former and current employees will have it without you, while qualified candidates are listening. Taking an active role in employer branding means that, in addition to reading about employee experiences, job seekers also hear from you about your company’s benefits, culture, and values. Job seekers are going to do their research on you. 75% of people will look into a company’s reputation before applying for a job. For millennials, culture fit is a top priority when looking for a job. People are even willing to accept a decrease in pay for a company that is positively reviewed online. In a competitive environment for employers, workers can afford to take their time looking for a position that fits their lifestyle and career goals. Your employer brand should get people excited about the possibility of working for you, especially if your interview process requires work exercises or travel. Your application process might be a hurdle, too. 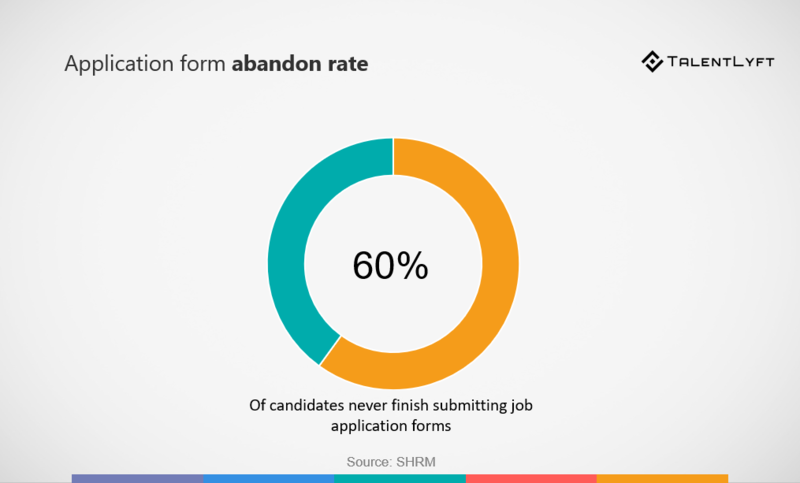 According to a Society for Human Resource Management report, 60% of job seekers quit in the middle of filling out an application, so make sure yours is as quick and easy as possible. Your most compelling argument for working with you are your employees themselves. 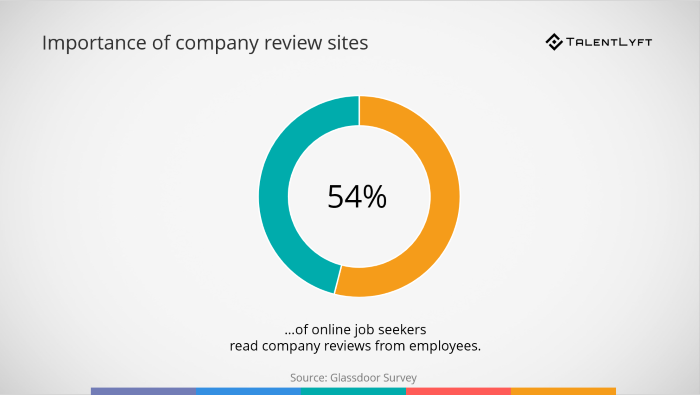 That’s why employer review sites are so popular - because past and present employees can tell the true story of how a company really functions. Your employees can contextualize the benefits and policies that set you apart. For instance, an employee might share how flexible work hours allow him to pick his kids up from school. Always remember that your employees are the most trusted source of truth about how your company works. When they livetweet a conference or post a photo of a team event to Instagram, they are extending the reach of your employer brand beyond your LinkedIn followers. The people behind your product are what make your company human and interesting. If you want to tell the story of your company, they are your best storytellers. What happens when employees become advocates? When you have a great experience, you want to share it. This innately human response is behind every food photo on Instagram, every check-in on Facebook, and every 5-star review on Google. It’s also a key contributor to more hires than you’d think. Glassdoor’s report has found that when employees refer their friends to your company, those referred candidates are 2.6–6.6% more likely to accept your job offer. According to LinkedIn’s 2017 Global Recruiting Trends Report: “Referred employees are faster to hire, perform better, and stay longer in the company”. If you give your employees an experience worth sharing, the ripple effect will extend far beyond the walls of your office. Employer brand ambassadors don’t just directly refer qualified candidates to your company. Remember those scary employer review sites? Engaged employees will want to submit their own positive reviews out of gratitude and a desire to attract qualified peers. When job seekers see what employees love about working with you - even alongside some points of criticism - they can weigh the pros and cons to make an informed choice that they still feel excited about. How to encourage brand ambassadorship? It’s important to remember that, when it comes to your employer brand, there are some factors you can control and some factors that you can’t. You can control the content and message on your official company pages and social media accounts, but you can’t control how employees will talk about your company to family and friends. Employee brand ambassadorship isn’t accomplished by pressuring employees to gush about their workplace – it’s done by creating a culture that makes them want to. The reason that referred employees are so successful is that they already understand their new company on a deeper level. It's not just that they heard positive feedback from their friends; they already know what they’re getting into and want to reflect well on their referrer. Employer brand ambassadors put a human face on your company’s careers page. This isn’t the place to tout impressive sales figures or technical achievements; this is the place to let your employees’ individuality shine. Did your company launch a new product or a splashy new advertising campaign? Make sure your employees are in the loop. Though organic reach is harder to crack than ever, employees will want to share content that makes their employer (and, by extension, them) look good. Smarp Communications reports that “one employee share generates about 4 clicks on Facebook on average”. Whether it’s an internal newsletter or a company intranet, find a way to deliver interesting, shareable company news to employees. More and more companies are encouraging employees to share their day-to-day working experiences with a company-wide hashtag. Hootsuite posts blogs, stories about employees, and photos of team events under the hashtag #HootsuiteLife. By allowing employees to post about their experiences at work (with some guidance, of course), positive word-of-mouth will spread across their networks, and you’ll be able to collect content to share the best photos on your company’s official accounts. Events and company outings are a great way to treat employees to activities they might not experience otherwise. Unconventional team-building events like ax-throwing, rafting, or ropes courses give employees the opportunity to get outside of their comfort zone, get to know each other and get invested in the company culture. Not to mention, fun work-sponsored events are incredibly Instagrammable. Does your company have a company’s career blog? If so, you can enlist the help of your employees to tell people what it’s like to work with you. A blog post from an employee showcases that employee’s personality while highlighting a corporate culture that values its people. Blog posts are also a great way to introduce new employees to the company and to customers. By answering a few interview questions about their work, hobbies, and motivations, a new employee might encourage job seekers with similar interests to apply. The holidays are coming up, and many companies use this time of the year to send employees home with a little something extra. If you’re planning on purchasing company-wide gifts for employees, it might be a good opportunity to spread the brand. When employees unbox that awesome Bluetooth speaker and tell their friends about their company Christmas gift, your logo will make its way into the photo, too. While giving employees cash incentives to mention your company online might seem like a quick win, truly engaged employees don’t need them. They will share job listings and branded content because they want the people they care about to feel as fulfilled at work as they do. Part of encouraging employees to tell your brand’s story is trusting them to tell the story right.